All children benefit from strong families and safe communities where their needs are met. Most children are growing up with these supports. Unfortunately, many are not. 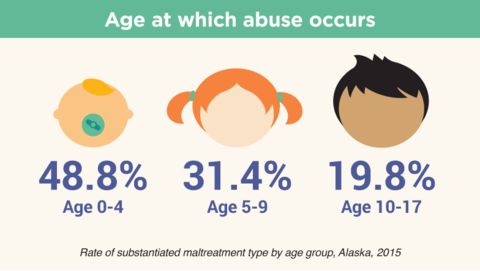 Over a million children in America experience child maltreatment each year, and Alaska has amongst the highest per capita rates of child abuse and neglect in the country. Each year, thousands of child abuse and neglect cases are substantiated by the Office of Children Services (OCS). Some communities face challenges in providing an environment that promotes positive outcomes for their children. When children’s needs are neglected, their growth and development can be affected, with life-long costs to them and to all of us. The mission of the Alaska Children’s Trust (ACT) is to improve the status of children in Alaska by generating funds and committing resources to eliminate child abuse and neglect. While these statistics are grim, there is good news. Learn more about Adverse Childhood Experiences and what you can do to help to help children build the resilience they need to overcome them. Learn more about child abuse and neglect in Alaska in our 2016 community report.